Blizzard conditions will spread across Wichita, Topeka, Omaha and Enid during the during the day Thursday (Christmas Eve) and reach Kansas City Thursday night. With snowfalls ranging from 5 to 20 inches across this region and wind gusts to 50 mph, travel will be dangerous or impossible. Update IV, 1:55pm Wednesday. AccuWeather has a graphic of the blizzard area at the link. 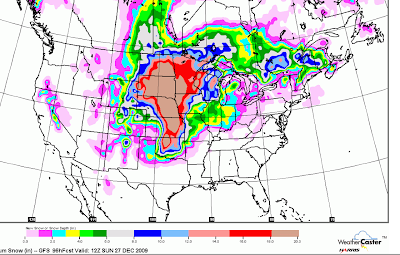 Ice storm conditions are likely in a good part of Iowa, northern Illinois and scattered areas of Kansas and Nebraska. Icing-related accidents have already been reported in western Kansas. These conditions are moving east. Tornadoes and severe thunderstorms are possible from east Texas into the Lower Mississippi Valley. Update II, 8:45am. The area from Houston to Shreveport looks especially primed for tornadoes. Update VII, 2:40pm. Tornado Watch in Effect! At this time, a tornado warning in effect south of Tyler, TX. I am not going to blog on the ongoing tornado threat, please see the AccuWeather radar link. And, if all of this is not enough, flooding will likely develop in Arkansas and parts of Missouri. If the latest data is correct, this will be one of the most vicious winter storms of my career. AccuWeather is on top of things, as always. Click on the link for the latest. Our excellent winterized, decluttered radar is here. AccuWeather's airline tools are here. If the ice develops in northern Illinois, don't even think about trying to go through O'Hare or Midway while the storm is in progress. A guide to proactive airline weather avoidance is here with additional information here. Update VI, 2pm: Airline waivers are in effect. Use them! United's waivers are here. You can view other airlines' waivers at their websites. Use AccuWeather's extended forecasts to determine alternative travel dates then rebook your flight to avoid being stranded in an airport, or worse. The bottom line: Be proactive and travel before or after this storm. If the forecast is wrong, you'll be safe and you can laugh at me. But, if the forecast is correct, you will save yourself, at minimum, a tremendous amount of hassle. And, if you are in an area where freezing rain is forecast, be prepared for power outages, perhaps of extended duration. Get where you want to be before the storm hits, hunker down, and enjoy watching the white Christmas move in. UPDATE I, 7:45am Wednesday: Numerous accidents reported on Interstate 70 in northwest Kansas with as many as 5" of snow on the ground.